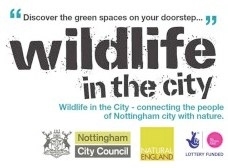 On Saturday, 10 March at Stonebridge City Farm: Wildlife in the City will come to Sneinton and St Anns. With Nottingham in Bloom, the organisation will be holding a FREE workshop on how to invite wildlife to your garden, wherever you live. Free seeds to take away and make-your-own insect habitat to get you started!